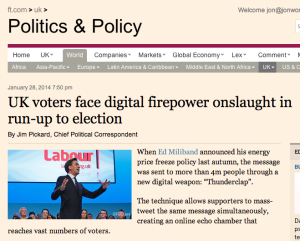 Sorry, I actually don’t want a “digital firepower onslaught”. I’d prefer better politics. I have not been developing websites for politicians for a while now, preferring instead to do consultancy and training work for a variety of different political and governmental actors. The problem was essentially that you can bring a politician to the social web, but you cannot make them drink, and that is why website design for politicians ceased to be intellectually interesting. To put this another way, politicians see the potential of the web in classic political terms – as a means to reach more people – but largely forget the other side, that the social web gives everyone else a voice too. And now we seem to be systematising this way of doing online politics. That’s hence what worries me about Jim Pickard’s piece in the FT today entitled “UK voters face digital firepower onslaught in run-up to election“. Mark Pack’s blog drew my attention to the piece. I do not disagree with the way that Jim and Mark explain their views. I instead worry about the outcome. As a citizen I do not want a digital arms race or a firepower onslaught, a means to extract every last little drop of information and activity out of me as a voter or a political activist. I want a better way of doing politics. I do not want a ‘thunderclap’ when Ed Miliband announces a new energy policy – I instead want a voice in shaping what that new energy policy should be. I do not want to be forever pestered every more cleverly to follow what the party HQ has decreed; I want a greater say in how politics works, and how it impacts my life. That, I fear, in the UK at least, is precisely the opposite of what is happening. @Martin – yes I do actually. I worked on energy market policies for a year in the UK civil service, and have been following the policy area on and off since then. But that it’s energy policy is beside the point – I want a better process for making *all* policy. Energy policy was just the case cited in the FT piece. @Paul vs @Ben – this is not me as a keyboard warrior crying “listen to me!” This is me as a citizen wanting decent two-way communication as an integral part of the policy making process, where voters, party members, pressure groups, and, yes, even interested individual citizens have a role to play. The last thing I want is for decisions to be taken opaquely and then to be blasted with messages in social media telling me why I should agree. I am more likely to agree if I was part of the process or, in the case it’s something I don’t care about, be at least content that the process was decent and open. So I am with Ben on this one. @Prussia – I agree there is a huge load of disengaged people that need to be reached. But you’re sure not going to reach those people by this sort of onslaught either, because they will just be turned off by it. I would like politicians to be statesman and have some dignity and gravitas. not to be tweeting like morons and needing validation of childish ‘likes’ on FB. Alas those days are long gone. You forget that you are in this bubble, you care about this stuff and understand it. There are a lot of people and I am sorry to say this, but Britons in particular, who are not engaged with politics, either their own or that of the EU. They need to be reached. If they are not reading the newspapers, watching the news or discussing it then they need information to be signposted with a big neon sign online. Paul says “I don’t want a voice …” – which in effect is the end of democracy. Democracy, as Abraham Lincoln described it, means “government of the people, by the people, for the people”. Politicians should not be an elite who live separately from the rest of the population. An elected representative should be exactly that, which means listening to the voters – not just at election time, but on a permanent and continuous basis. Hence I would rather non of us any great influence and politicians and leaders were driven by a combination of ethics, pragmatism and evidence. Part of that best practice would of course be persuading people that of the ethical dimension and evidence base for their policies. Do you know anything about energy policy? Do you have the time and the inclination to learn?